[quote]Here is a case where a cast of solid and interesting actors become the main reason to watch. 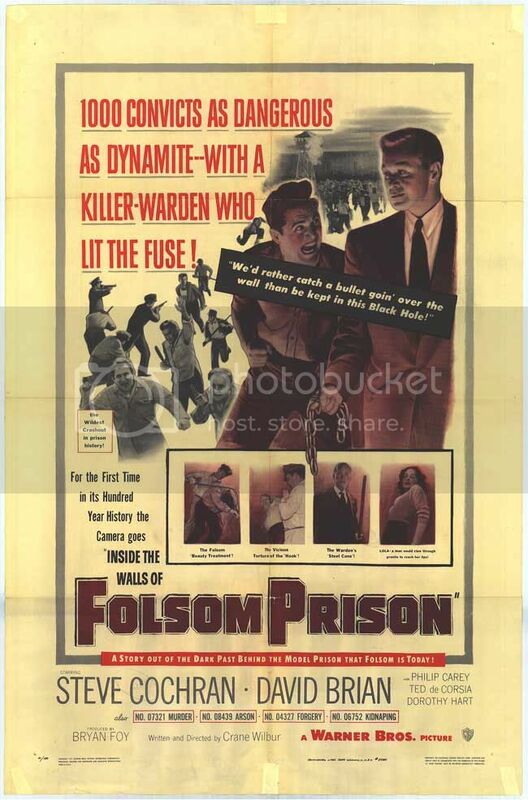 INSIDE THE WALLS OF FOLSOM PRISON is not in the league of great prison movies like BRUTE FORCE, but it has some singular qualities that will make fans of the prison movie genre want to seek it out. The film opens with the prison speaking--yes, a familiar-voiced narrator speaking as Folsom itself. The intention of the film is a lesson in prison reform. But we are spared any dryly didactic speech-making. The opening sequence is full of super-charged action, as several prisoners carry out a plot to assault guards and take over. Their initial attempt fails, leaving the ringleaders at the mercy of con-hater warden Rickey (a nicely corrosive Ted De Corsia). Rickey is not just intolerant of any resistance from prisoners, he's sadistic and cruel. In a scene reminiscent of BRUTE FORCE, Rickey beats a prisoner (Paul Picerni) to unconsciousness behind the closed door of his office. But there is no Wagner playing loudly on a phonograph to cover the violent sound. Even his own guards are disgusted by Rickey's brutality. Later, we are treated to scenes of stool-pigeons and the revenge exacted on them by fellow prisoners. Things start getting more out of hand as a new, well-meaning head guard (David Brian of THE DAMNED DON'T CRY) tries to introduce a more tolerant approach. Steve Cochran is billed as the film's star, but his character, Chuck Daniels, does not come into his own until well past the mid-point. Daniels is a prisoner famed for several previous escapes. And in Folsom he does not disappoint. It's great fun watching Daniels lead a daring escape attempt. And the film has a satisfying final payoff. Cochran, De Corsia, Brian, Picerni are terrific, at the top of their acting game. Also great in the cast: Philip Carey and Edward Norris as nasty Sgt. Hart. James Griffith (the 'Zachary Scott of the Bs') makes a notable stool-pigeon. William Lava's score is attractive and rarely intrusive. Watch this one for the great cast. partiendo del DVDR subido por pranzis en Cinematik. También hay disponible un DVDRip (XviD) que he subido a KG, aunque en la red ed2k sólo voy a compartir este MKV. La calidad de la fuente (DVD de la Warner Archive Collection) justifica ampliamente el "upgrade" de los ripeos disponibles hasta el momento. Por 6.000 € netos mensuales te convierto en el mejor presidente de la historia. Muchas gracias. Totalmente desconocida, incluso del director, no tenía referencias. Con Ted de Corsia y Steve Cochran si me identifico más. A descubrirla. La subo. Gracias y saludos.